In 2009 I published a website review of the book ‘Brighton Diaries: Memories of a Young Man in Peace and War 1929-1943’ by local man Ken Chambers. It was an interesting book about Ken’s experiences and it sold very well. 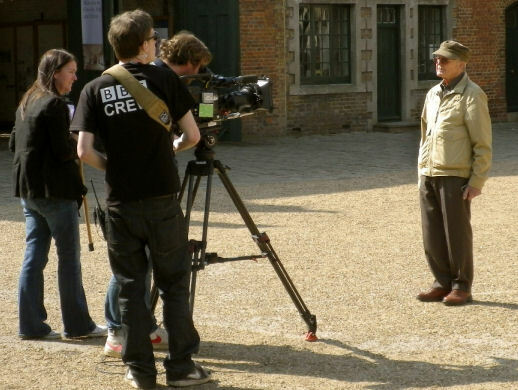 Now Ken’s memories of his time in the Home Guard are to be part of a TV programme. and local regional archives. The BFI is the home of the world’s largest and most diverse collection of film, TV and film-related material. “The event went very well and I was there four hours – it was a good day – About twenty or so attended and I had two or three interview sessions while being filmed, as well as individual camera shots. 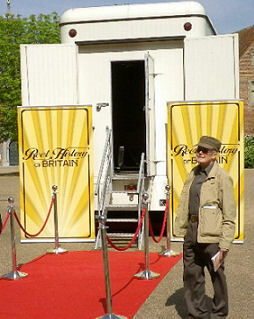 There was a film show in a restored mobile cinema to start with. It was like a furniture van and the seats faced the back so when the doors were closed they became the screen with the projector just behind the driver’s cab. There was a BBC camera in front, below the screen, which traversed from side to side filming the expressions on our faces. 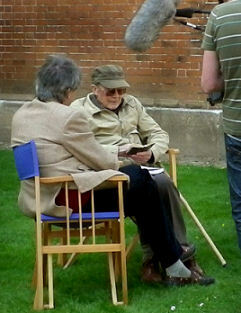 We were shown an old wartime film of the Home Guard and another they had made using a re-enactment team”. The series starts on BBC 2 on Monday 5 September, and the episode featuring Ken and his Home Guard colleagues is on Monday September 12th at 6.30pm. If you can manage to watch, you can leave any messages for Ken in the comments section below. Watched the programme Ken – you were a star! I particularly loved the story of the gun going off. What a wonderful keepsake the programme will be for you and your family. Congratulations – you even got a mention for your book, ‘Brighton Diaries’. I knew about the show and tried my hardest to get it, but it appears that BBC2 cannot be seen in the US. Ken is an email friend of mine, through military experiences. I was in the USAF 1952-1972. Last 3 years I was stationed in Germany and we became acquainted through a mutual friend that was stationed on the same mountain top. We’ve been emailing since 2003 My wife and I have read his book and loved it. My wife always comments how it reminds her of her childhood and later. I agree wholeheartedly with Jennifer. Ken, you are as natural a broadcaster as a writer: your tales are so vivid and in-the-moment. More, please! Am intrigued to know what was edited out of this programme, particularly your contributions. It certainly felt as if it had been ruthlessly edited. But I bet you were surprised and pleased to get your book included after all, albeit fleetingly! Hi Ken, I watched the show too and thought it was great. The BIG screen next I suppose! Ken – I am the daughter of Joan Heather Gilmore. She moved to Scotland, married, moved to Staffordshire in 1966 where she died about 30 years ago. Her grandson now lives and works in Brighton. How amazing that you remember my mother as a teenager! It certainly is an amazing link up Susan. Thank you. I have now met your sister, Morag, and relived the past of the 1930/40s as written in my Brighton Diaries. Hopefully we shall meet again as I now believe in miracles.